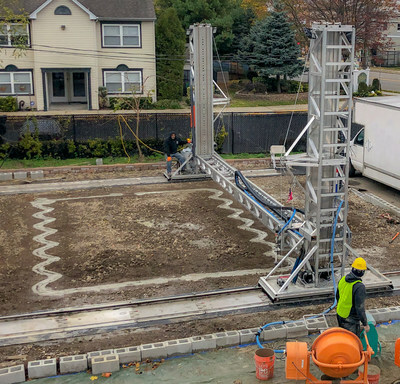 PATCHOGUE, N.Y., Dec. 6, 2018 /PRNewswire/ -- After years of research, development, and capital investment, S-Squared 3D Printers (SQ3D) is proud to present its patent pending Autonomous Robotic Construction System, (ARCS). ARCS takes a completely new and futuristic approach to traditional construction. This machine builds everything from homes and commercial buildings, to infrastructure such as roads and bridges. S-Squared technicians and engineers during calibration testing. This specialized 3D printer outperforms traditional construction by reducing both time and cost up to 70%. It is considered the most safe, effective, and eco-friendly way to build, defining the new standard for future construction. SQ3D leverages proprietary cutting edge technology to solve the increasingly complex demand of today's construction. ARCS projects range from 500 square feet to over 1 million square feet. 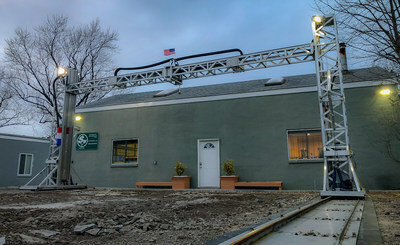 The 3D printed structures can withstand the most severe weather, including high winds from hurricanes. Structures are impervious to water and are fire and mold resistant. All structures built with ARCS have a structural integrity that can last a century and require little maintenance. ARCS is mobile and safely sets up in as little as six hours. OSHA instructors have praised this machine for its potential to reduce some of the most common injuries associated with construction. This is a game changer that will revolutionize the speed, quality, cost and safety of building and construction. "Changing the way the world is built." SOURCE S-Squared 3D Printers Inc.